I approached this album somewhat tentatively, having read endless critical reviews that spoke of "poor old U2".... "not what they were"... "sad to see such a demise..." and so on. 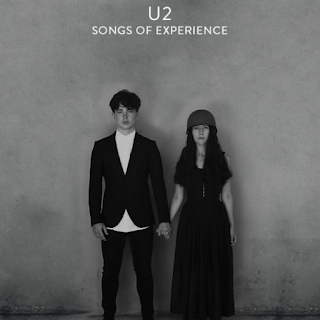 I was definitely expecting the worst - just "another U2 album". As it happened, I have been most pleasantly surprised. I have found it quite a refreshing listen. Certainly sound-wise it is the most clear, defined and "open" for a long time. The industrial, impenetrable, crashing bombastic sound that has dominated their music since "Achtung Baby" has given way to a more nuanced, slightly lighter sound that is still powerful, but actually has a clear stereo separation for once. I have read criticisms of this album that say that the band are trying to recapture the sound of "October". Well, good for them if they are. It was a great album. After the ethereal, low-key, ambient opener of "Love Is All We Have Left", "Lights Of Home" is an infectious number with a great guitar solo that is not in the usual Edge style. "You're the Best Thing About Me" is a thumping, recognisably U2 song with, for me, vague echoes of Bruce Springsteen's "The Fuse" in Bono's phrasing of the verses at one point. A notable thing is that The Edge's guitar is not as typically omnipresent in the material on here. "Get Out Of Your Own Way" has some catchy build up verses and a big, pounding chorus. There is a subtle melody to this too, though. I listen to this and don't quite get the criticism. Yes, U2 have their sound. Of course they do. It seems to be the curse of any group or artist that have been around for a long time - they cannot escape their past. Paul McCartney, Van Morrison, The Rolling Stones, Bruce Springsteen, Bob Dylan, Elton John...anyone who is still putting out music in their usual style get a critical slagging off. If they try to diversify a little, like Paul Weller, they get similarly lambasted. Putting out great material in your early career is the worst thing you can do in terms of getting critical acclaim later in your career. "American Soul" is one return to the powerful, relentless attack of the last few albums, but the excellent "Summer Of Love" is a tuneful, rhythmic and very appealing number. Possibly my favourite on the album. The backing is intricate, melodic, percussive and Bono's voice is impressive too. "Red Flag Day" has an intoxicating sound to it, with some great rhythmic drumming from Larry Mullen. Adam Clayton's bass is nicely discernible as well. It still finds time for a bit of stadium rock, anthemic "oh-oh-ing" though. I really like this, however. I am not a "proper" U2 fan, so this is perhaps are more objective view, listening to the album from a more neutral perspective. For many, who have listened to U2 albums regularly over many years, this is probably just a disappointing "more of the same". For me, who listens to U2 about once or twice a year, (it was the same in their eighties/nineties pomp) I found myself really enjoying it. I know where they are coming from, though. U2 have a problem in that people expect them to remain "relevant". If I were them I wouldn't give a damn. Just do what they want to do. Unfortunately for them, sometimes I think maybe they do bother about that sort of thing. Similarly, "The Showman" has a fetching acoustic intro and a spirited upbeat feel to it. Again, I think this is a really good track. "The Little Things That Give You Away" is one of those slow-paced, plaintive Bono numbers, sung against a mournful synthesiser and Edge guitar backing. Lovely bass underpinning it too. U2 became a monster group for a reason. Songs like this are why. "Landlady" is another beguiling, low-key slow burner. It is enigmatically beautiful. "The Blackout" is somewhat blighted by an over bassy thump (and I like bass) and it employs some Paul Simon-esque "back, Zack" rhyming in the lyrics. "Love Is Bigger Than Anything In Its Way" is a stadium-type anthemic number that is probably one of those that annoys people. It still has its appeal though, although its like has been heard from them many times before. Becoming a "stadium" act has been the blight of many an artist. Who wouldn't prefer to see The Rolling Stones or Springsteen in a smaller venue? The same applies to U2. The closer, "13 (There Is A Light)" is an atmospheric, haunting song that would have been hailed a work of genius if it had closed "Achtung Baby". As it is, it sounds a little bit overdone in that earnest Michael Jackson way here. 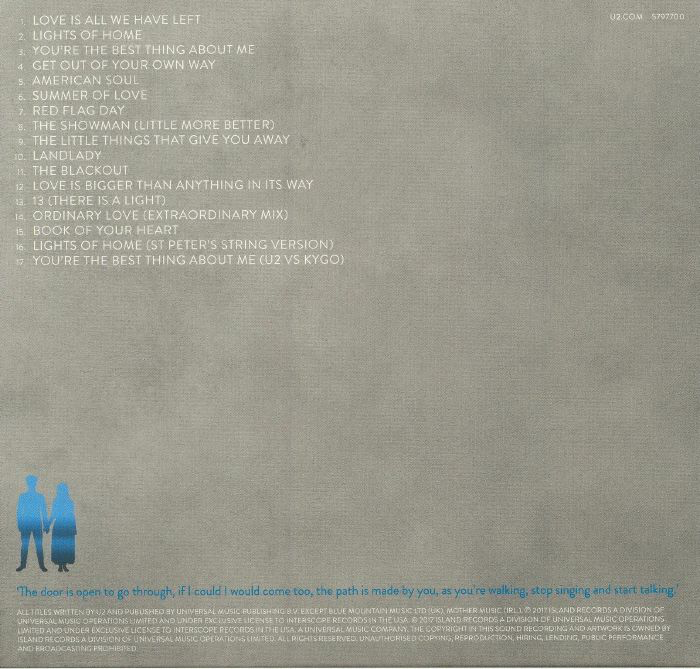 The bonus track "Ordinary Love" is incredibly catchy, with some great bass lines and guitar breaks. 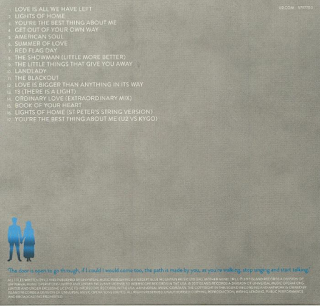 "Book Of Your Heart" is evocative, but very much U2 as you would expect to hear. Overall, though, I thoroughly enjoyed this album.